The spear head overshot is released and pulled up to the derrickman so that he can thread it down through the next stand of pipe. This operation is repeated until the overshot is at a short distance of the fish. At this point, the mud is circulated to remove all the cuttings and debris in the overshot and on the top of the fish. 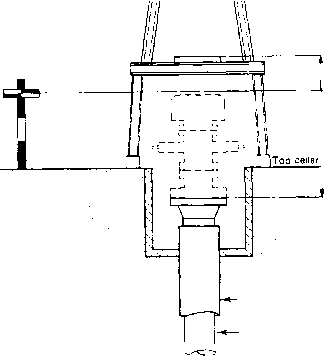 A circulating sub attached on the top of the drill pipe tool joint in the rotary table holds the lower section of the cable while circulating with the kelly; pump strokes versus pressure are recorded. The fish is then engaged, another record of pump strokes versus pressure will indicate if the fish is caught in overshot. The cable hanger is clamped on the cable below the rope sockets, and the hanger is set in the elevators. The weak point is broken by pulling on the cable with the elevators. The cable is pulled out of the drill pipe and the string is pulled out of the hole.